Cherial village located in Janagoan Division, 85 km from Warangal district in Andhra Pradesh. Cheriyal Nakash artists have a very prominent art form up their sleeves. The Nakash artists have been identified by the rulers of the Kakatiya era and the Nizams, 400 years ago for their delicate artistry. Originally known for Sawdust Masks & Toy Making and Scroll Painting skill, these Nakash artists have become popular across the world as – The Cheriyal Painting Artisans. 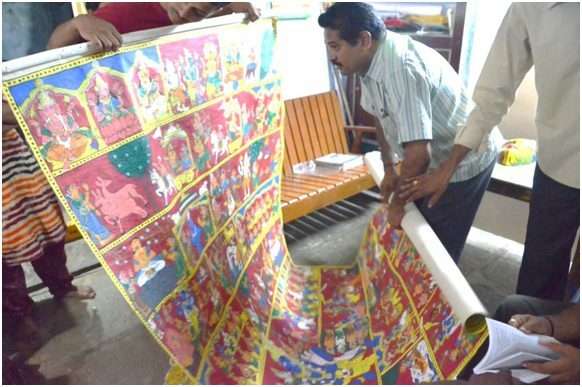 Traditionally, the artistry was used to paint scrolls which illustrate the history and the culture of certain section of people in the rural areas of Warangal. It is a unique depiction of how the caste system evolved and how people respect and follow certain rituals drawn not only from the history but also from mythology. The materials used for masks and doll making are very humble which are available locally. However, the process of procuring, refining and mixing the raw material to create a proper medium is very tedious. The process of making the mask or toy or doll involves six stages. The toys thus made were initially used by the traditional story tellers who would travel to every village carrying these toys in huge baskets. The story tellers use the toys to depict certain mythological characters and sing the related story. After the story telling they would also sell the toys. This culture still prevails in parts of Warangal district. Sawdust toys are now available at the Jataras and Tiranaalu at Komuruvelli Malleswara Temple, Vemulavada Temple etc. The idols of gods, diyas and works like ‘Donthulu’ are sold especially during Festivals like Dusshera and Diwali. The ‘Kaki Padagalus’ narrate the ‘Mahabharata’ to the Mudiraj Caste people. The ‘Kunapulis’ narrate ‘Markandeya Puranam’ to the Padmashali Caste people. The ‘Chaakali Pattam vaallu’ narrate the ‘Madel puranam’ to the Chaakali or the Dhobi Caste people. The ‘Enutis or the Gouda Jettis’ narrate ‘Gouda Puranam or Kanthama Maheshwara Puranam’ to the Goud or the Toddy collectors’ Caste people. The ‘Addapu vaallu’ narrate ‘Naadukaa Puranam’ to the Mangali or the Barber Caste people. The ‘Dakkalis’ narrate ‘Jaambavanthuni Puranam’ to the Maadiga Caste people. The ‘Gurrapu vaallu’ narrate ‘Gurrapu Puranam’ to the Mala Caste people. The ‘Korrajulu’ narrate ‘Lakshmi Devara and Padma Nayak Puranam from Mahabharat’ to the Nayak or the Tribal Caste people. The ‘Mandahecchus’ narrate ‘Katam Raju Kathalu or Stories’ to the Golla Caste people. The Scroll paintings are customized for every story teller. The story teller spends many days with the Nakash artists to narrate the story. The artists make a rough draft as per the story teller’s version. The length of the Scroll painting can range anything between 10 meters to 25 meters depending on the length of the story. One Scroll painting can take as long as 3 to 6 months of time to complete. During this time the entire family of the Nakash artists involve themselves in the various stages of the Painting. The Scroll painting is done in 5 Stages. Desired length of Khadi Cloth roll is used for this painting. This cloth is treated with tamarind paste so that the Scroll remains termite-free for years. After drying, the Scroll is again coated with paste made of white powder. This coat gives the cloth strength as well as smooth finish. Once this base is ready, the Nakash artist marks the design and draws all his outlines in a phased manner. The colouring is very meticulously done by the Nakash artists. They carefully select their colours. They use black outlines at the final stage. Each such Scroll painting is prepared with a mere dedication towards keeping the art form alive. The storytellers pay between Rs. 25000/- to 35000/- to the Nakashi artisans for each scroll. Cheriyal Scroll paintings in their miniature form are available as Wall Frames in many of the State owned Art Galleries. Two such paintings are showcased at the Salarjung Museum in Hyderabad. These paintings are 100 years old and not attacked by termites, because of the tamarind pulp treatment given to the cloth or paper in the initial stages. The traditional art form is passed on from one generation to the next. As of now there are only four families practicing this art in the true form. It’s high time we encouraged these artists and supported them to keep the Cheriyal Nakash Art legacy rolling. Come! Let’s encourage the Nakash Artisans of Cheriyal.